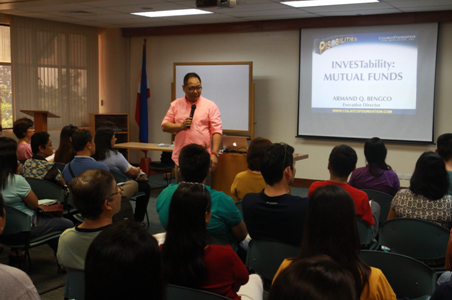 Take this opportunity to learn about mutual funds and how you can invest into it. Mutual Funds are considered the greatest democratizer of investment instruments. You can start investing for Php5000. But since it is not common knowledge, many people are skeptical. Francisco J. Colayco and the Colayco Financial Education strongly believes that mutual funds is one the best investing instruments for entrepreneurs who want to grow their money and enjoy 8-20%+ average annual returns. This is perfect for increasing capital and accumulating wealth for the business any entrepreneur has in mind. Do not be intimidated by this investment opportunity. You can now learn more about mutual funds so you can start investing into it. Register and be among the learners of the ‘Investability: Mutual Fund Seminar.’ Slots are still open in the afternoon session. Venue: AurumOne Hotel Evangelista, Makati, Metro Manila.